So Easily Irritated . . . Some of us spent the past month studying our way through 1 Corinthians 13 together. We ran headlong into a lot of convicting words. Two little phrases really stood out to me. Love is not easily provoked. We found that the word in verse four that describes love actually means “long-tempered” — the opposite of short-tempered. I find that in the midst of the day’s demands, in the face of the little, everyday irritations and interruptions, I often fail miserably at being long-tempered. We also found that when love bears all things, it bears with troubles and trialsquietly, without telling everyone about its suffering and without venting about it. Again, I fail so often at this. 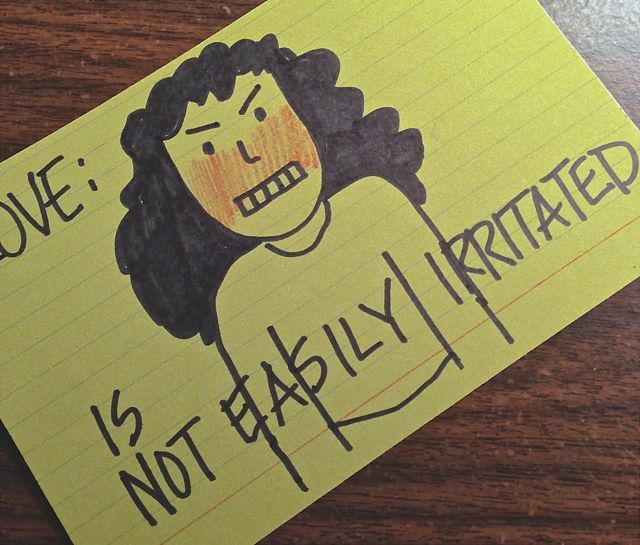 Why is it so hard to have a godly attitude about a rude driver, the tenth red light in a row while we’re running late, the cat that insists on joining me in the bathroom, or the bottle that falls out of the refrigerator onto my toe when I open it? Why do these little irritations prove to be such big temptations to sin? It is sin when we grumble and complain about the little tests God brings over and over in our lives, no matter how reasonable or innocent it might feel while we’re doing it. “…No, you do not get a pass because you can handle the big problems in life with this promise [that God causes all things to work together for our good] but not the small ones. Perhaps when sickness, death, and affliction come into your life, you run to God and His promises and find comfort that gives peace and patience. Maybe it is just the small stuff that you sweat. So what is the big deal? Everything! In fact, your complaining about the small stuff is more dangerous than complaining about the big, because life is made up of the small stuff. Tragedies punctuate periods of your life, but it is the smaller inconveniences that make up the bulk of your existence, and this is what most people will see you handle. Those situations are the most obvious testing ground of your faith. If God’s grace is big enough for you to handle the big problems, why isn’t it enough for you to walk meekly through the smaller issues? Wow. Did you catch that? Life is made up of the small stuff — one moment on top of another, each filled with God-ordained events. How I react to the small stuff shows what’s really going on in my heart. Lord, give us grace to trust you. Boy did I need this today…seriously. Thank you! That's just me, is amazing how God has used this ministry to talk to me in many ways, let's put grace to practice ALL THW TIME!